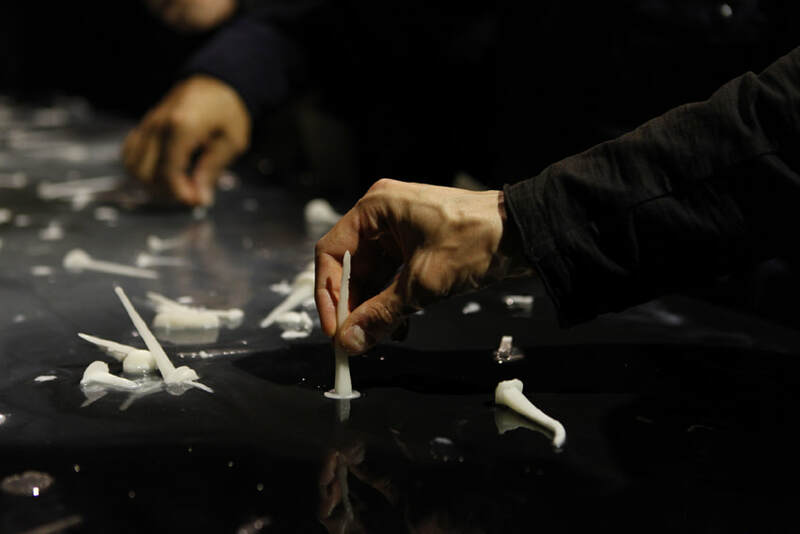 Born in Damascus, Hratch Arbach makes artwork and builds installations that take on some of the toughest issues in Middle Eastern politics today, such as the Syrian Civil War and suicide bombers. Arbach is from a Christian family, the child of a Syrian father and an Armenian mother. Pursuing a career in science, he moved from Damascus to Paris in 2000, completed a doctorate in molecular biology, and then eventually became an artist. Arbach studied at l’Ecole Nationale Superieure des Arts Decoratifs. 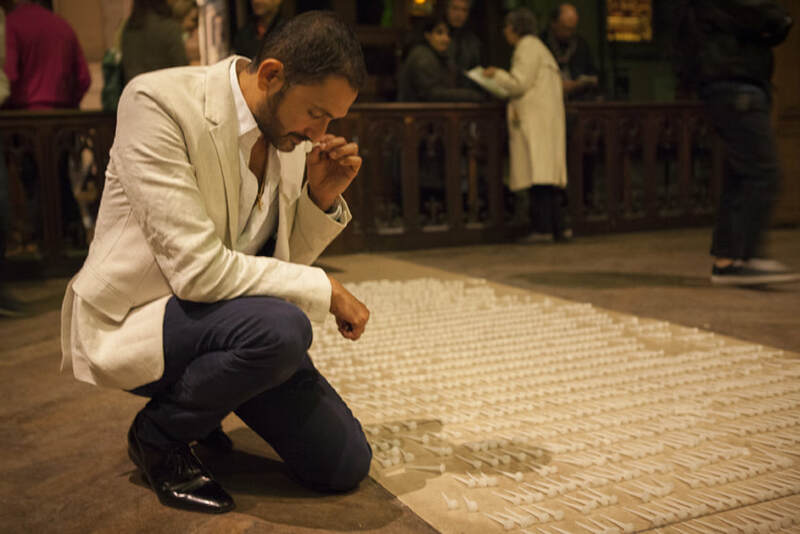 In 2014, he became the first Middle Eastern artist to take part in Nuit Blanche, an annual all-night arts festival in Paris. 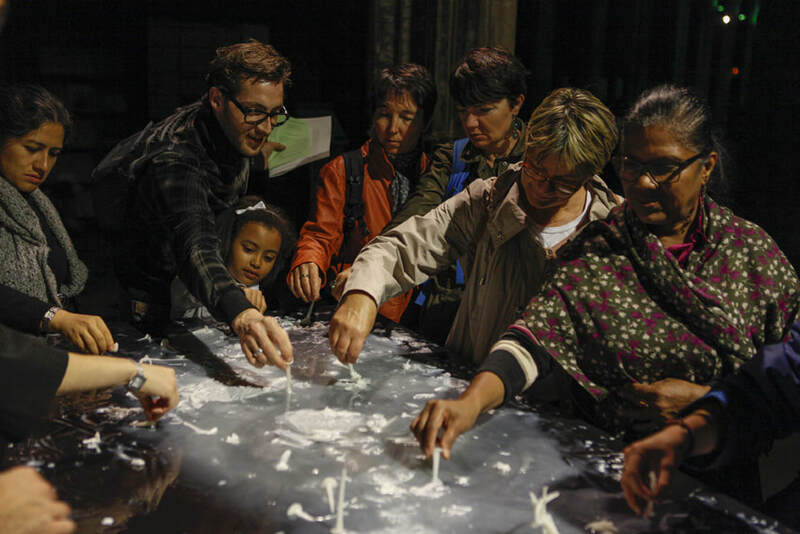 Arbach exhibited his installation, “Mawtini—Notre Terre” in the Church of Saint-Séverin in the Latin Quarter. I met Arbach in his home in New York City to hear about this work. ​How did you feel as the conflict escalated in Syria, watching it from Paris? When the events started in the beginning of 2011, I was watching the news with a kind of enthusiasm, believing in what some were calling the Arab Spring! Then after a few months, I realized that the media were covering only one part of the events. I was hearing different stories from parents and close friends living in Syria. I also had my own life experience as a Syrian that didn’t match the reports. So I started having doubts about the truthfulness of the situation. Things came more clearly to me when I visited Damascus in 2012. I realized the complexity of the catastrophic events. It’s hard to explain. There are these existing conditions inside Syrian society: historical realities, economic and geo-political interests, manipulation by some exterior forces. Then there’s religion that has been used as a tool of division. This combination led to a civil war eruption. the power of the mass media to manipulate and control our way of thinking. They play with our conscience, and they can build a dominant opinion that everyone has to follow to serve their interests. I like the philosopher Bernard Stiegler, and he explains that we live in a society of hypercontrol. And in this society, the lack of our human conscience transforms our minds to a simple organ of reflex. I think this concept can partially explain the irresponsible behavior of most intellectual people to the situation, especially Syrian artists. They used the violence and the victimization as a main subject. There’s this war, the Syrian war, and it’s a timely topic. Everyone is asking: what are the artists and writers saying about it? It suddenly became more interesting for everyone. But in the end it started to look boring because they were all playing the same game. It’s a very destructive phenomenon. My first response after a long period of suffering was to start to learn how to transform the act of watching into an observation, the reaction into a reflection and the anger into an understanding. If you choose to be involved in any collective movement, first you need to raise awareness on your individual level. You need to make your mind alive. How did this process work for you? The main quest for me was to find my inner freedom, the true deep meaning of liberty, where the notion of space can completely disappear. It is a long and hard task . . . this is my path. For that reason, I chose to develop a more personal approach, using my own life experience as an experimental field. In 2013, I started to ask myself: why did I leave Syria? Why did I decide at an early age to move and settle in Paris? Out of that came the work in “Syria, My Forgotten Land,” a photography series of various landscapes in Syria, of my hometown Damascus and of nine portraits of people very close to me there. This project was the beginning of a long journey to try to understand what pushed me to refuse my actual realty then. Let’s talk about “Mawtini.” In this installation, you wanted to take on the war directly. Somehow yes, it was an urgent matter. It is my responsibility as an artist, and what I thought about immediately was reconciliation. How did your background, especially religion, show up in this work for you? I was born in a Christian family in a Middle Eastern country where religion—whatever it is—is the major component of the society. Denying or ignoring that part of my formation would be a big mistake. While living in Syria, I practiced Christianity. Later on, when I moved to Paris and started a new experience, during those 15 years I was exposed to a new mode de vie. Art, mythology, and philosophy had an impact on my conscience and created a new way of seeing religion. It led me to have the freedom to develop a spiritual life without following rules or belonging to any institution, which is to have an ethical way of living. So today, when I ask myself, why did I choose a church for this installation?, it is because in the intersection of my childhood memories, my cultural heritage, and the background of the conflict, I found that a church was the instinctive place to give a shape to the hopeful concept of my installation. I shared my thoughts with the priest, and he loved it. So I got to work. You started to bring in these various elements? bring people together, which makes the basis of a functional society. So I transformed candles into nails. I collaborated with the French candlemaker, “Cire Trudon,” the oldest and the most prestigious wax manufacturer in the world. 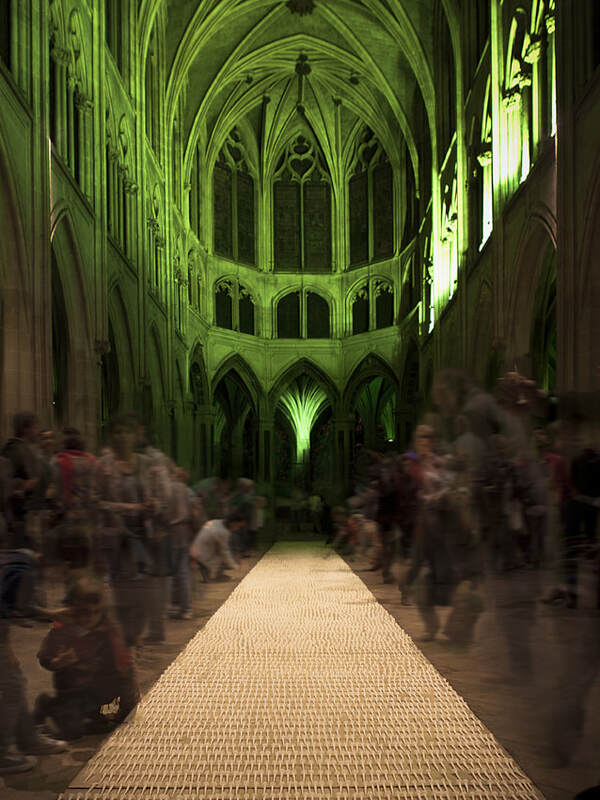 With the help of my father-in-law, we made 20,000 nails made out of wax, and then we lined them up on the floor on the main aisle of the nave. My team and I, we also built a heated altar. So people, instead of burning a candle, they would each take a nail, and that nail represents a suffering in each one of us, as we all carry a different type of pain. Then people will go and melt this wax nail on the heated altar, as it melts it will mix with the other melted ones. Like this we are all sharing our pain but at the same time we are getting rid of it. You don’t have to participate if you don’t want to. But if you do, you have to reach down and pick up the nail—it requires you to decide to do it. And you can take it to the altar to melt it. You have to want to do it. There’s a voluntary action. That was crucial. And there was a paper you handed out with poetry, too. Yes, poetry is so powerful—it pierces your mind. I selected poetry from many Arab poets such as Gibran Khalil Gibran, Mahmoud Darwish, Al Buhturi. They spoke about the love of earth. The title “Mawtini” in Arabic means “my homeland.” But in French it translates to notre terre, which means our earth, so “Mawtini—Notre Terre” fits well, because we belong to the earth, and the earth belongs to everyone. There are no borders. Yes, Samuel Liégeon improvised for more than seven hours to the tunes of the pipe organ. Yes, he read the poems and got his inspiration from them. He improvised on the organ from there. The music resounded through the church, a mix of Middle Eastern, sacred, modern tunes. The outcome was impressive. represented the war martyrs. And the earth for the love of earth. Each wax nail had one of these three scents. 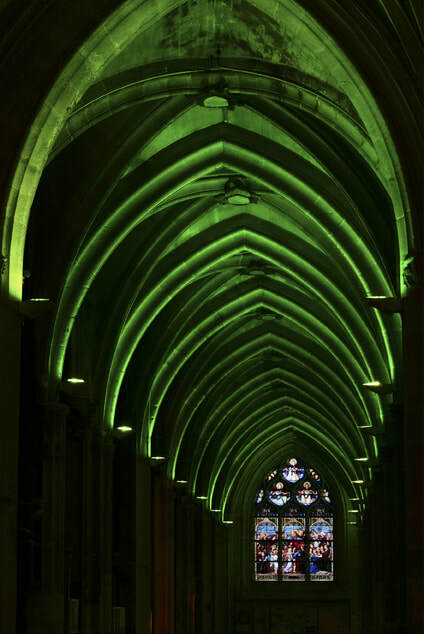 You can only imagine all this: a gothic church, organ music, green lights, poetry, mixed scents, 20,000 wax nails and a heated altar. There were more than 1,500 people who came. Some cried in the pews, some meditated, and some prayed in this peaceful atmosphere. It was overwhelming. Would you think about doing this installation again? Certainly, I love the idea of ephemeral experience. So to repeat it, it wouldn’t be exactly the same thing but adapted. I have completed an installation that questions the nature of suicide bombers. I’m looking at the human dimension in this act as a witness of the loss of our human identity and the individual self-destruction in the global society. Architecturally, the configuration of the space in my new installation will be like a sacred temple. Conceptually, I want to reposition the place of religion in our society and reveal how fanatic organizations take over the minds of young people. What is your hope for this work or for the other works you’ve made? On an individual level, a constant research in my inner truth . . . . On a collective level, a wake-up call of our conscience.